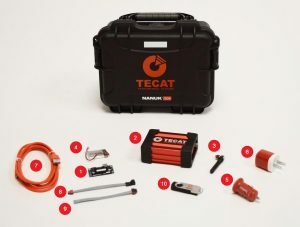 The WISER 4000 system is the standard product of TECAT’s low-cost, ultra-low power and extremely accurate strain sensor. The wireless system has the optional ability to measure 3-axis acceleration, barometric pressure and ambient temperature, all within the same incredibly small footprint. The 4000 includes on-board data logging without PC or DAQ connectivity, and remote flash capability, which enables firmware upgrades without removing the system from the unit under test. Featuring shunt calibration, TECAT’s latest WISER system is designed to simplify instrumentation verification for users, while allowing them to check calibration of the system in the field. In addition, the WISER 4000 has been enhanced with two additional programmable analog outputs, a higher-speed recording, and is available with custom-built remote enclosures to protect the system’s remote unit and battery from damage due to debris. The WISER 4000 is comprised of three subsystems. The remote unit consists of the data capture electronics connected to Micro-Measurements strain gages, a transceiver, and a long-life battery. The base unit plugs directly into a PC USB port and houses an antenna, transceiver, and up to four analog outputs. The WISER Data Viewer software is used for system configuration and calibration, live monitoring, and data logging and recording. The WISER 4000 enables positive and negative shunt calibration with two independent shunt calibration legs using 100 kΩ resistors. The WISER 4000 began shipping in Q3 2016.